In planning for this Christmas seasonâ€™s festivities, it is important to keep your dogs in mind. While most of us welcome the sights, sounds and smells of the season, it can also be chaotic, especially for dogs. 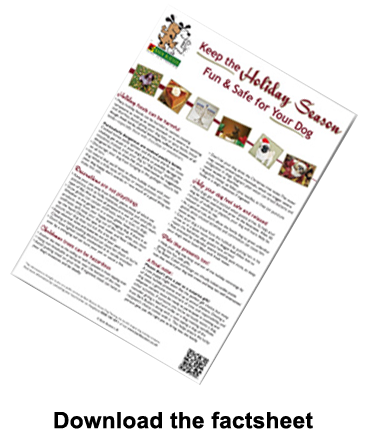 The festivities can interrupt a dogâ€™s routine and present a potentially unsafe situation. By following a few simple tips, the festive season can be fun for everyone, including your family dog. Many festive foods can be harmful and toxic to dogs. These include fatty or spicy foods, breads and dough, fresh herbs, alcoholic beverages and sweets of all kindsâ€”especially those with chocolate or artificial sweeteners. Particularly dangerous are cooked bones. Cooked bones easily splinter and the bone shards can cause choking or get stuck in your dogâ€™s gums. Instead, give â€œdog bonesâ€ specifically designed for dogs to chew. 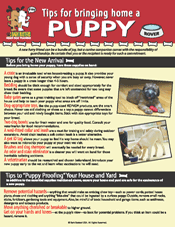 Ask your veterinarian or pet shop for suggestions. Discourage your dog from foraging in your bins and try to secure all of the lids. Itâ€™s natural that youâ€™d want to share treats with your dog. While a little taste of turkey or sweet potatoes can make your dog happy, donâ€™t overdo itâ€”too much of a good thing can make him sick. Keep your pet away from plants, many of which are poisonous, such as holly, mistletoe, poinsettias and amaryllis (a type of lily). Also be sure all potpourri is out of your petâ€™s reach. Snow globes can contain antifreeze, which is extremely toxic to dogs. Keep any antifreeze products away from your happy dog. If there is a spillage, send your dog out of the room while you clean up the liquid. Dilute the spot with plenty of water and use a pet safe floor cleaner and ensure your dog does not lick the area later. Keep electrical wires and batteries out of your dogâ€™s reach. Chewing or biting anything electrical can cause him shock or burns. Donâ€™t leave lighted candles unattended. A lit candle knocked over by a swinging tail can burn your dog or cause a fire. Secure the tree to the ceiling or wall to prevent it from tipping over. Hang non-breakable ornaments near the bottom of the tree. Avoid putting tinsel on your tree. If ingested, tinsel can twist in your dogâ€™s intestines and be deadly. Regularly sweep up fallen pine needles, as they can puncture holes in a dogâ€™s intestines if ingested. Most dogs get very excited when guests arrive. To help your dog be calmer, exercise him prior to the festivities. After 30 minutes of walking or playtime, your dog will more likely be relaxed or want to nap. As a general rule, donâ€™t allow the family dog to greet unfamiliar guests since unusual activities and commotion can cause him extra stress. Dogs stressed by unfamiliar events typically pant more, so give your dog a break from the hustle and bustle by putting him in a quiet room with his doggie bed. Allow him to rejoin the festivities after guests have arrived. Donâ€™t forget to keep your dogs bowl filled with plenty of fresh water. Please donâ€™t give a pet as a surprise gift! A cute puppy might seem like the perfect gift choice, but many of these â€œpresentsâ€ end up at rescue centres. Owning a dog takes a genuine commitment of time and responsibility and adoptive owners must be ready to participate in training and other activities. If someone you know seriously wants a dog, consider giving a collar and lead, or a dog training certificate from Bark Busters along with a note saying a dog of the recipientâ€™s choice comes with it. This helps ensure the lucky person gets just the right pet to bring into the family. Following these simple tips will help make the festivities safe and happy for your whole family, including your canine companions.